These jackets seem to run on the big side according to our observations and Tour Master’s size chart. Compared to other brands, the Jett jackets look to be about one size larger than listed. Take a look at Tour Master’s published size chart below which reflects that observation and seems fairly accurate. Sleeve lengths are measured from the shoulder seam down to the end of the sleeve cuff. Tour Master has dropped the price even further on the Jett Series jackets. This latest version gets you quite a bit of jacket for the money. 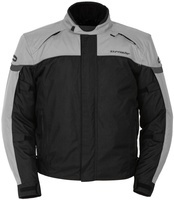 A mid-weight textile jacket that is waterproof, vented, and comes with a fully sleeved insulated liner at this price is quite a bargain. The Jett Series 3 features a waterproof barrier built into the shell which should do a good job keeping the rain out. The main zipper has a Velcro storm flap as well which is nice. One thing you should know about this type of waterproof barrier is that while it does a good job keeping water out, the outer shell of the jacket is still going to get soaked and can take some time to dry back out (not a problem on hot days!). Speaking of warm weather, the Jett Series 3 has zippered vents at the shoulders, arms, and back to help cool you off. That waterproof liner will not allow air to flow directly to your skin, but it is breathable so there is somewhat of a cooling effect. This jacket seems like it would do well in colder to warm temperatures but you probably need a mesh jacket for really hot weather. The fully sleeved insulated liner is quite warm and should do its job on all but the coldest of days. There is Phoslite reflective piping across the upper torso and sleeves on the front and back, along with the signature Tour Master reflective triangle. For comfort there are adjustable sleeve take ups and waist adjustment belts, all of which use hook and loop material. I would rather see snaps on the sleeves but I suppose you can’t have it all at this price. One very nice touch is the collar and sleeve cuffs are lined with a microfiber material which makes the jacket very comfortable to wear. Be sure to check out our custom photos of this jacket by clicking the “View Larger Images” link above.